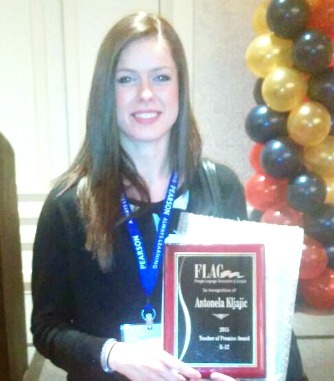 Antonela Kljajic may be relatively new to the teaching profession, but she has proven her skill and talent in the classroom. Kljajic, a third-year German teacher at Starr’s Mill High, is Georgia’s 2015 Teacher of Promise for the Foreign Language Association of Georgia (FLAG). The award recognizes teachers in their first, second or third year of teaching who show promise to be an outstanding teacher and leader in foreign language education. Recipients must demonstrate evidence of effective planning and implementation of lessons, use of a variety of techniques and approaches in the classroom, and advocacy for foreign language education. In addition to teaching, Kljajic also sponsors the school’s German Club and German Honor Society.